Better Protection—Multi 9 supplementary protectors and miniature circuit breakers limit let-through current, providing faster separation of the component from the fault, thereby reducing system damage. More Selection—More ratings compatible with low-power electronic circuits are available in the range from 0.5 to 10 A. Others are provided in convenient steps, up to 63 A for the C60 products. Reduction of Nuisance Tripping—Available with different trip characteristics to meet system needs: B, C and D curves, depending on the model. Panel Space Savings—Multi 9 products are compact. Width per pole is only 0.71 in. (18 mm) for the C60 circuit breaker. All of the products are built in a consistent format with incremental widths of 0.35 in. (9 mm) (therefore the name Multi 9). Easy Installation—The Multi 9 products mount easily onto a 35 mm DIN mounting rail. Large box lug terminals (pressure plate type) are suitable for use with copper wiring up to 2 AWG for C60 circuit breakers and supplemental protectors. Reverse Feeding— Reverse feeding of line power is permitted. Reliability—Each C60 miniature circuit breaker has an endurance of 10,000 operation cycles and voltage withstand of 6000 V impulse rating. World-Wide Availability—The Multi 9 products are available and supported throughout the world by Schneider Electric. 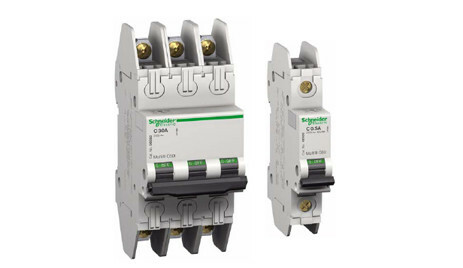 Download the Square D Multi 9 Circuit Breakers PDF below or call 714.835.6211 for more information.